Add an attendee - Click the Add Attendee button in the top right corner. Enter a gamertag to search for players with existing smash.gg accounts. 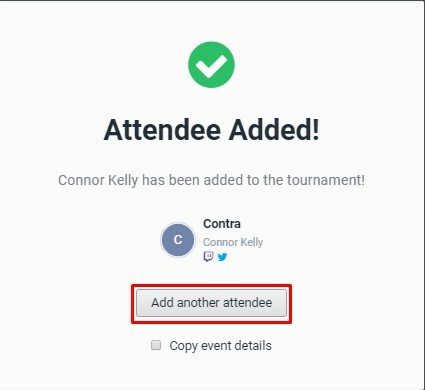 Attendees that you are manually adding do not need a smash.gg account. You can select the "Add someone without an account" option to create a player profile for them. Choose the events to enter the player into and mark them as paid or unpaid. For each event, choose which phase to add the player to, or choose none. 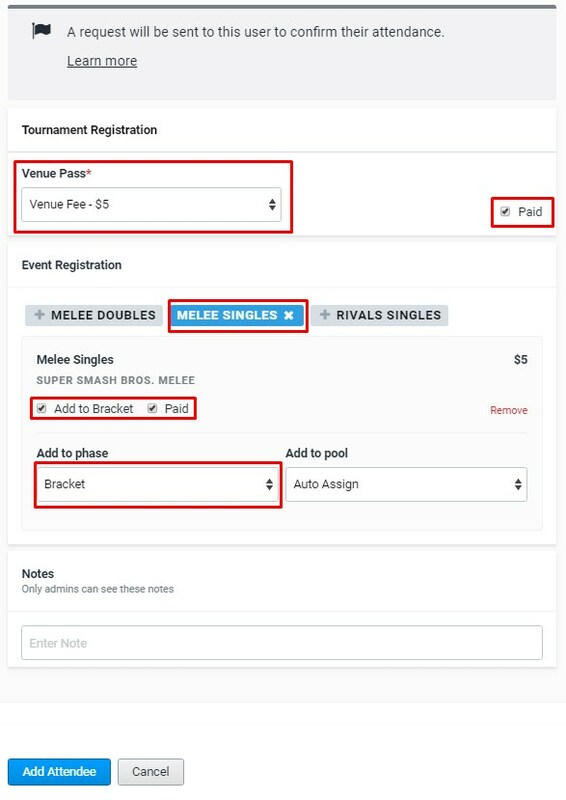 By default, they will be added to the initial phase, as designated in Bracket Setup. You may also choose which pool to add the player into. Edit existing attendees - Click on an attendee to edit prefix, phone number, city and state, events they are registered for, and their paid status. You cannot edit their name or region as this is set by the user on their account. You can also edit the venue pass type if needed. If you are using on-site registration, this is where you will mark attendees off as paid. You may also manually pair up doubles partners here. Delete an attendee - Click the three dots to the right of an attendee in the Attendees page and select "Remove Attendee".